Porterville, CA, September 17, 2004 TEDCF Publishing, a leading Authorized Autodesk Publisher of interactive courses for Autodesk Inventor, today announced the availability of Autodesk Inventor 9 Accelerated Productivity: Single Part Solid Modeling, the first in a series of courses for Autodesk Inventor 9. Single Part Solid Modeling provides over 5 1/2 hours of interactive instruction designed to significantly reduce the learning curve. Step-by-Step instruction is presented in short, fully animated movies that show and tell how to increase productivity with Autodesk Inventor 9 and how to use all the commands involved with creating single part solid models. Automatic Book Marking – Allows users to close the courseware, and then reopen the courseware for the next study session. The course automatically opens at the last viewed lesson. Quickly Find Lessons – All the lessons are accessible from the Lesson List simply by selecting a lesson from the list. Fully Indexed – The Memory Jogger allows users to enter keyword phrases to find a particular lesson. Users can easily find a lesson without knowing the name of the lesson. Simply enter a keyword phrase, and a lesson about the keyword phrase begins to play. Slider Control – This feature allows the user to drag the slider button to position the lesson at any point in a lesson. 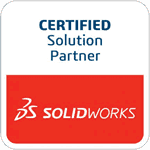 More information about Single Part Solid Modeling and a complete list of lessons.